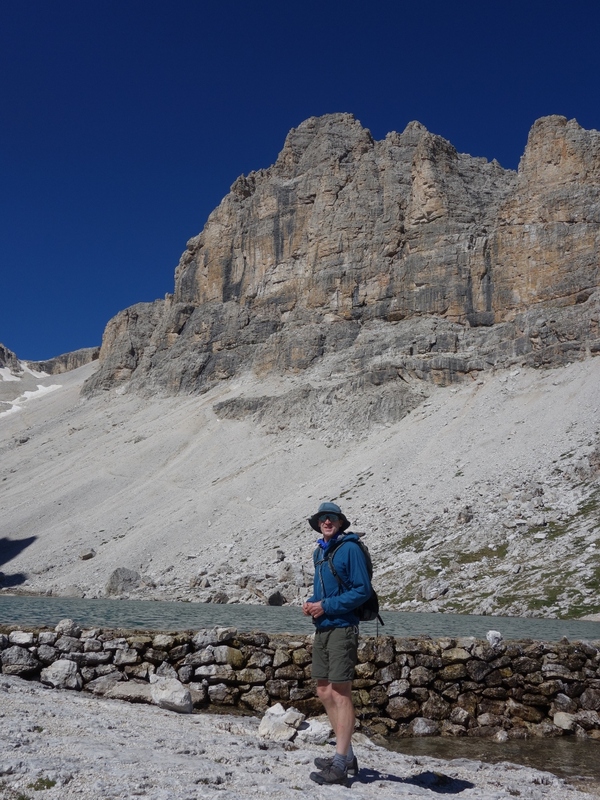 Having experienced this wonderful Via Ferrata on one of the busiest days of the years last year, we felt we would like to experience it all to ourselves, and also to extend our trip into the Pisciadù Plateau by walking across it to the Pordoi refuge. So we left about 5 am as soon as it began to turn light. 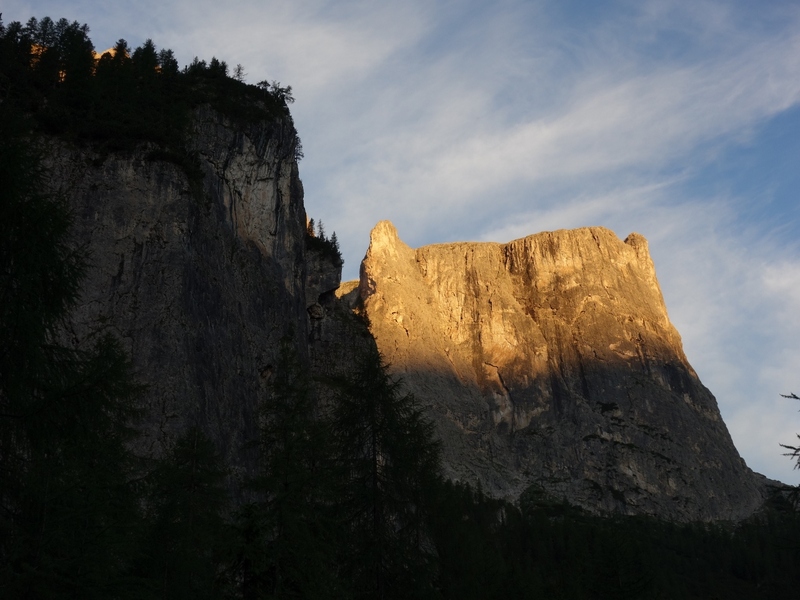 to walk across the meadows to the foot of the path in the almost dark, arriving at the Pisciadu waterfall as the sun was illuminating it into rainbows beside us. The ascent up the river is very steep, and we were hurrying to take advantage of our early start. We had chosen a good day for it with the sky a perfect blue and no cloud to be see. 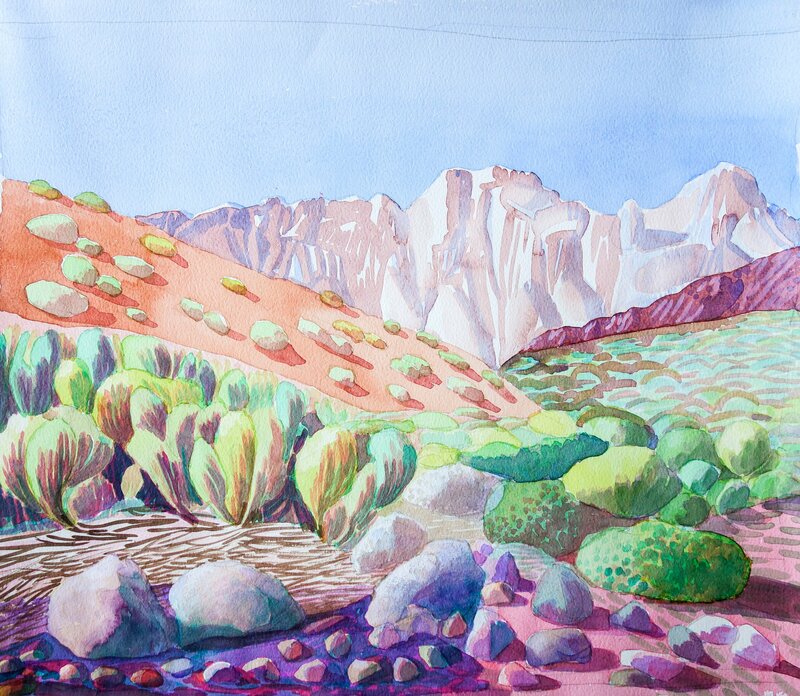 To walk across the plateau later, these great conditions would be necessary as this high mountain plateau is not place to be stuck in thunder or rain. As we prepared to start climbing we saw a couple of people approaching, who carried on to solo the whole thing and we imagined that they might work up at the refuge and be very used to the climb. 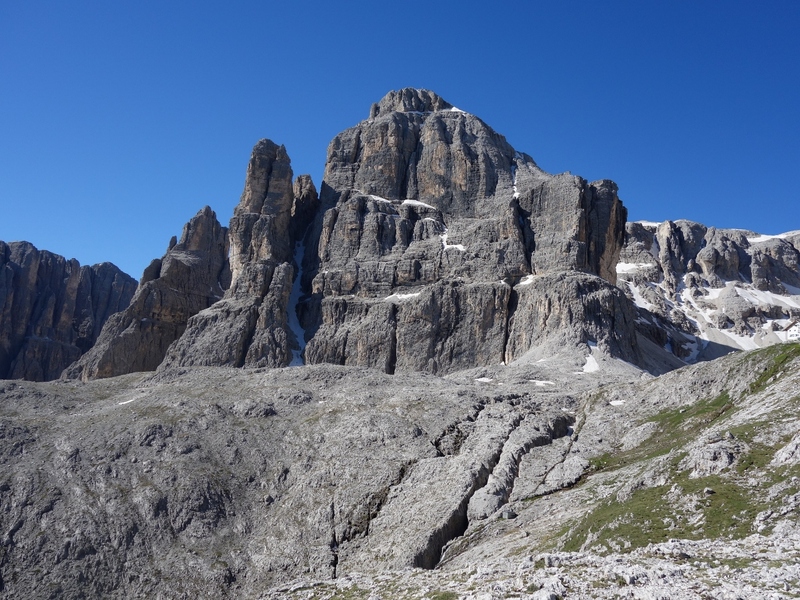 There are many factors that make the Tridentina one of the most popular Via Ferratas in the Dolomites . 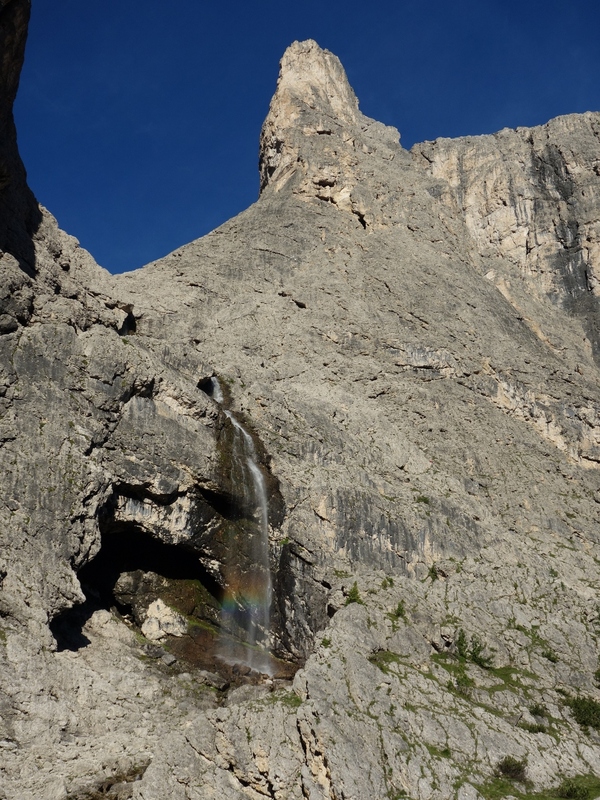 First of all, the beauty of the Sella Group’s walls, with the Pisciadù waterfall that falls next to the base of the ferrata. Then the panoramic views enjoyed during the whole ascent, with views of the village of Colfosco, far below. 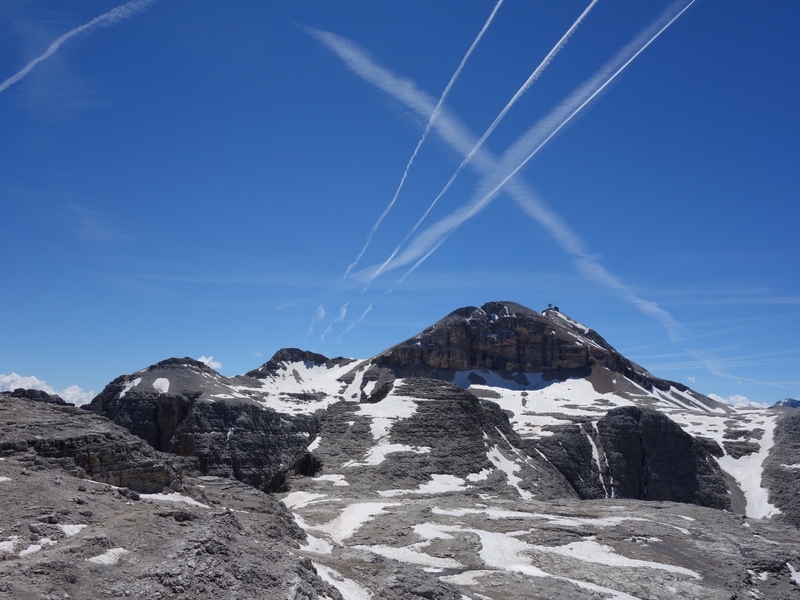 One of the main attractions of the route is the bridge suspended above a deep rocky split that leads from the Exner Tower (2,496 m) to the Pisciadù plateau, where you can see the Masores de Pisciadù and the rocky massif of the Sella Group . The first stage is pleasant, leading up from the car park, a little steep, leading to a flat area where an escape is possible and crossing two large rocky boulders along a level path leading to the second part, the more serious part of the ferrata, where on the left is the Pisciadù waterfall . This part is the longest of the three, and there is a vertical wall, which, thanks to the numerous ropes, metal ropes and ropes, comes to a large basin. 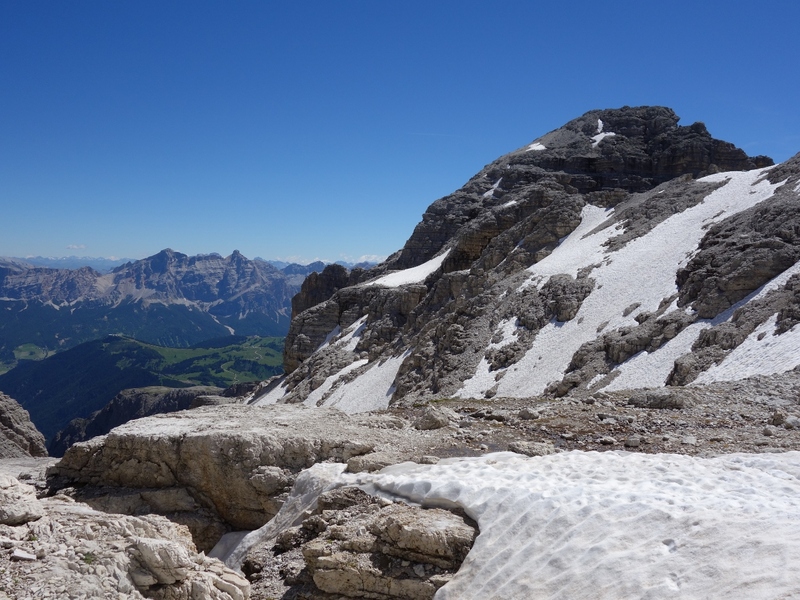 Here you can decide whether to continue uphill on a normal path, or continue to climb the top of the Exner tower (2,496 m). 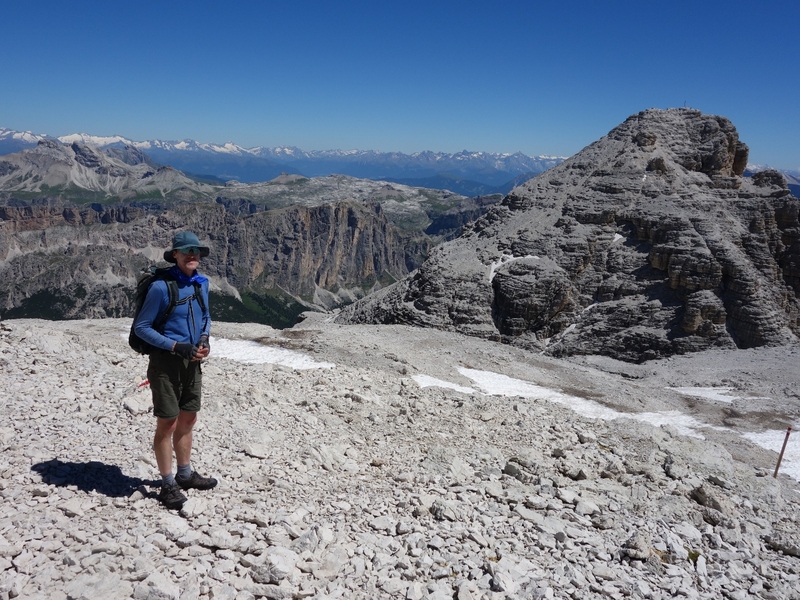 The latter part is not as long as the second part of the ferrata, but has some very exposed points, with wonderful airy views, which however are always well secured. The third section of the ferrata begins with some more exposed and vertical ropes, steps and passages, but very satisfying, especially when almost at the top of the Exner Tower (2,496 m), you have to cross a narrow suspended bridge that leads from the tower to all ‘Pisciadù plateau, after which in 10 minutes you reach the Cavazza haven in Pisciadù on a comfortable trail. 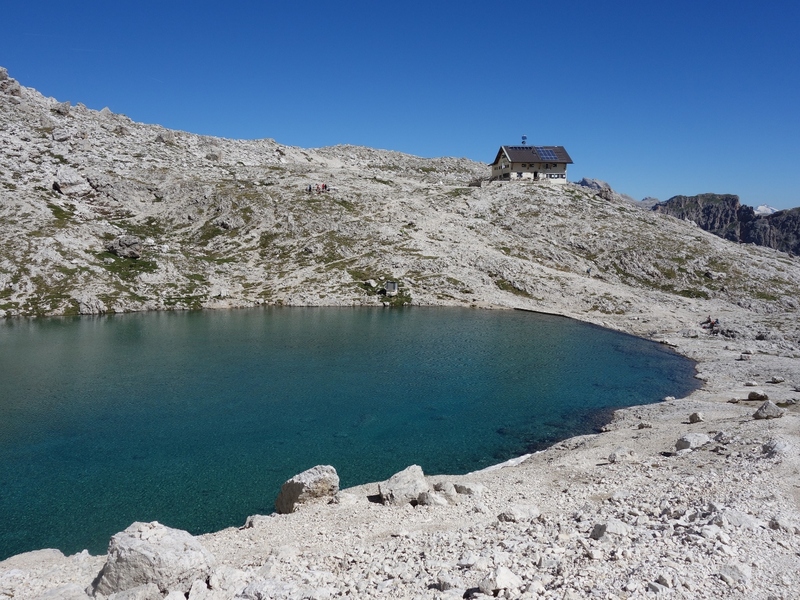 You have to take path no 666 that runs along the Pisciadù Lake and continues below the Cima Pisciadù and after a stretch with some ropes, continues uphill to reach the highest point on 2,900 m where you can see the plateau in all its beauty. 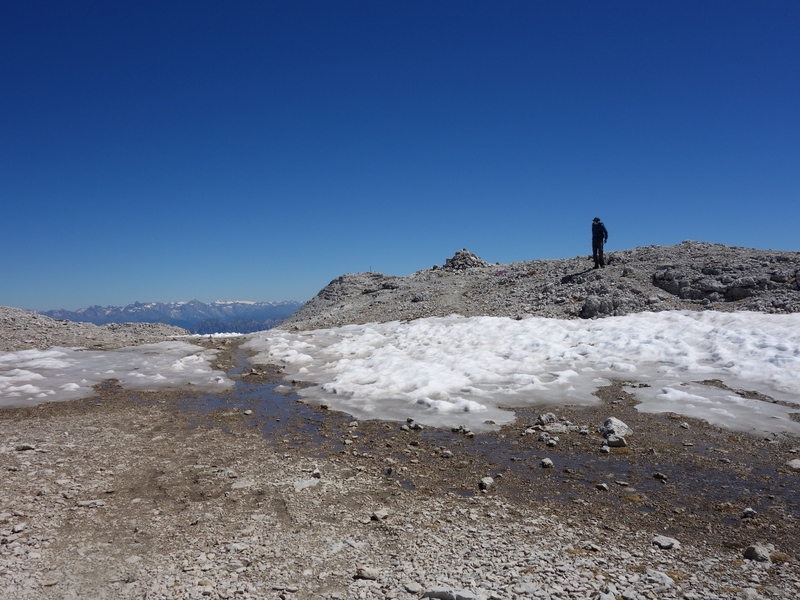 This entry was posted in ITALY, MOUNTAINEERING, THE ALPS and tagged alps, alta badia, CLIMBING, hiking, holiday, journal, mountain, photography, Via Ferrata, walking. Bookmark the permalink.